Robometricschool.- As electronic technology information media to provide you more information in technology event as complementary knowledge, robometricschool blog also will give you information about technology exhibition, technology event, etc. It is mean you know what event happen in this time. For several days again technology exhibition Consumer Electronic Show (CES) 2013 will be held in Las vegas Convention Center, Nevada, United State. CES 2013 will be held on 8th until 11th January 2013. As usual that in technology exhibition Consumer Electronic Show (CES) will be used to introducing new technology from many global electronic vendor. It is also will happen in CES 2013. As an annual event, CES has held since 1967 in New York city. Consumer Electronic Show (CES) has always been a barometer of the electronic devices that will appear throughout the year. CES is always extraordinary acclaim of businesses and consumers. In this CES 2013, there are more than 1200 factory from various regions, such as Asia, North America and Europe. CES 2013 This year, gadgets and wireless devices with the latest innovations exhibition will color that lasts. From CES 2013 organizer or Electronic Consumers Association predicted that smartphone and computer tablet will make good attention from visitor because this technology experience development very fast this day. To know more information about new or recent electronic technology innovation in CES 2013 you can follow information from CES 2013 organizer. There are 4 leaked innovation that should be noted in CES 2013. TELEVISION. In CES 2013Television tech OLED screen with a resolution of 4000 pixels would be one star. Samsung, for example, will bring ultra-high definition television with a 110-inch screen and TV organic light-emitting diode (OLED). SMARTPHONE. In CES 2013 some new phones mentioned would debut in CES 2013, including Xperia and Xperia Z or Yuga ZL or Odin. Both are made ​​by Sony. COMPUTER TABLET. In CES 2013 computer tablet with cheaper price is Nexus 7 new version. Nexus 7 will be sold with $99. CAMERA. In CES 2013 the company will introduce the Polaroid camera that comes with the Android operating system. But, unlike before, the camera with the name IM1836 is a mirrorless camera with a lens that can be removed. When you want to visit in CES 2013 you can choose electronic technology that you interesting with it. Remember, that usually in exhibition product price will cheaper, so you can use this moment to enjoy or buy several gadget with low price. 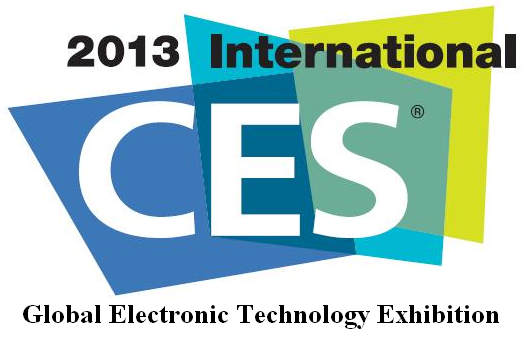 In CES 2013 you also can meet many speaker of electronic technology. As reported that Paul E. Jacobs, Chairman and Chief Executive Officer of Qualcomm, a maker of chip processor for smartphones will present in this moment. Other speaker that reported will present in CES 2013 is Marissa Mayer, Chief Executive Officer of Yahoo! Inc. Mayer will use this event to introduce the new Yahoo! after the past five years has stagnated. So, with many speaker in CES 2013 you also will know policy of electronic technology product in this time. Because this event very nice i think you can enjoy with present to this moment. You will get many information in this CES 2013 about recent smart electronic technology today.